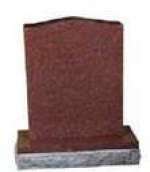 The staff at Falconer Funeral Home will help assist you to design and will order your granite markers. Flat Markers will be delivered to the cemetery the day of service if a Wilbert Vault is also purchased and being delivered. Flat Markers (if no vault was ordered) will be delivered to the cemetery in 21 days after date of approval. Upright and Slant Markers will be delivered to the cemetery in 90 days after date of approval.